The Villages, Florida United States - VILLAGE OF COLLIER VILLAS OF ANTRIM DELLS | RE/MAX PREMIER REALTY Inc. 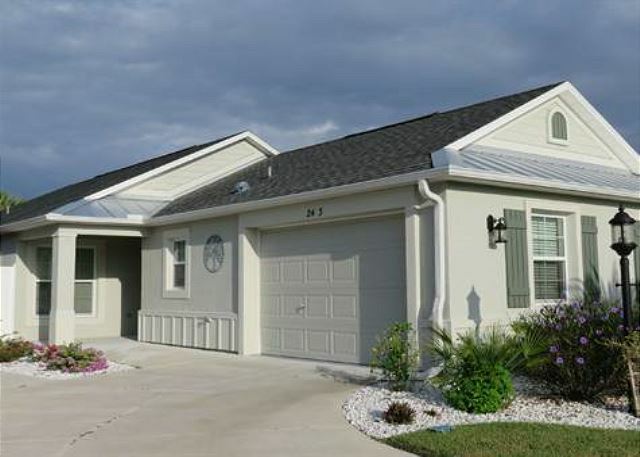 This beautifully decorated 3 Bedroom 2 Bath, 1 1/2 garage Courtyard Villa is located in The Villages of Collier in Antrim Dells. Superb location just across the street to the new Brownwood Paddock Square. This is the Charlotte floor plan. The open plan features a large and fully equipped spacious Kitchen with beautiful wood cabinetry and Stainless Steel Appliances. Open to the Dining and Living area that has a 48" flat screen TV and tastefully appointed furnishings and décor. The Master Suite features a King Size bed and a 28" flat screen TV. Bedroom 2 features a Queen size bed with a 24" flat screen TV and the 3rd Bedroom can be used as a Den or another Bedroom for Guests with the Full size Futon. Rent Includes phone, cable and WIFI internet. This rental has an inside laundry with washer and dryer. Golf cart for your pleasure. Due to the ‘high end’ nature of this property, this is a no smoking unit as well as a no pet unit. John & Helen B. from Flushing, MI United States recommends this vacation rental. we were very happy with the use of Dr and Mrs. Neumann's home. We're happy you enjoyed your stay, hope to see you again!